Pulse the flour, butter and salt in a blender until the mixture resembles large crumbs. Add the water and briefly blend until it comes together in a ball – then wrap in cling film and chill for 20 mins. Cut off one-third of the pastry and set aside for the lattice top. Roll the rest of pastry out on a lightly floured surface to about 4cm (1½in) bigger than a loose-bottomed tart tin, 22cm (9in) x 3.5cm (1½in) deep. Line the tin with parchment paper, trim the excess and lightly prick with a fork, then chill for 30 mins. Add the excess to the pastry set aside for the lattice top. Preheat the oven to 190°C/375°F/Gas Mark 5 while you pop the parchment paper on the pastry, cover with a layer of baking beans and pre-bake for 15 mins on the middle shelf. Remove the paper and beans and bake for a further 8-10 mins to dry the pastry out. Remove the tart and put it on a baking tray. Reduce the oven temperature down to 180°C/350°F/Gas Mark 4, ready for later. Roll the extra lattice top pastry out thinly and set aside on a tray to chill in the fridge for about 20-30 mins – this makes it easier to handle. Gently warm the Lyle’s Golden Syrup in a pan over a low heat, remove, then add the butter and stir until melted. Leave to cool a little. Beat the egg and cream together and then quickly beat this into the syrup mixture along with the lemon zest and crumbs. Pour into the pastry case. Remove the pastry from the fridge and cut into 1cm (½in) wide strips, longer than the edges of the tart tin. Arrange the strips at intervals across the tart, then place a second set across the first – so it looks like a basket over the mixture – leaving the strips hanging over the edge of the tin. Once the lattice is in place, trim the edges of the strips for a neat finish to fit just inside the tart. Bake on the middle shelf for 45-50 mins until richly brown and set. (The filling will still be a bit wobbly but it will firm up on cooling.) Remove, leave to cool until warm, then remove from the tin, slide onto a plate and serve. This tasty recipe is from Lyles Golden Syrup. 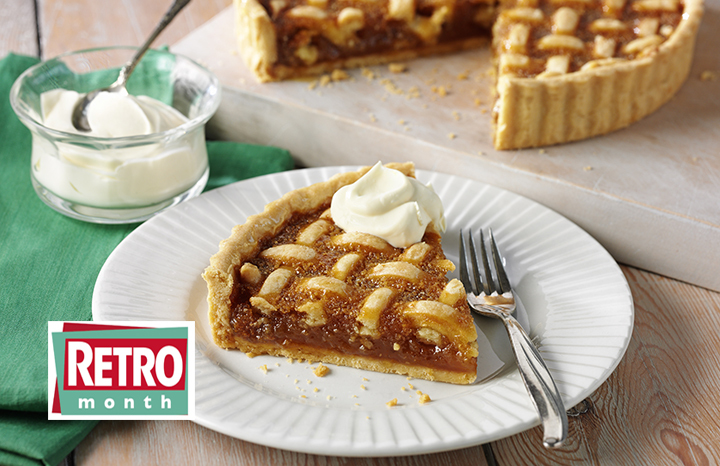 For more puds and tasty suppers, grab the latest Yours from the shops.